Rangers caretaker manager Graeme Murty described his feelings as “raw” after his side fell to a second consecutive defeat at Inverness last night. Murty’s reign went from bad to worse after another 2-1 reversal. 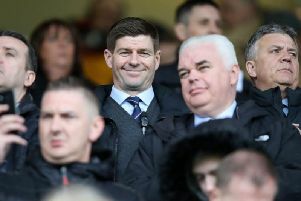 Aberdeen now have the chance to extend the gap between them and the Ibrox side in third place to nine points if they beat Ross County today. A late winner from Billy Mckay saw Rangers slump to another defeat after last Sunday’s 2-1 loss to Dundee. Greg Tansey’s long-range effort opened the scoring for the home side, who also missed a late penalty. A Martyn Waghorn spot-kick drew Rangers level but McKay struck with an overhead kick with a minute of normal time left. The win moves Inverness off the bottom but increases Rangers’ woes. Murty revealed he is taking advice from an un-named mentor provided by the club board. “I have been put in a very difficult position but the board have taken steps and I’ve been offered help,” he said. “I have taken advantage of that help but, at the moment, that will remain private between me and the person who is helping me.